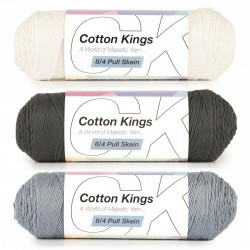 Hobbii is a proud exclusive distributor of Cotton Kings, and thus you are always guaranteed the best price. 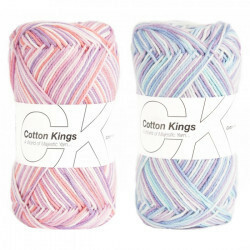 Cotton Kings yarn is for you who loves to work with cotton yarn. 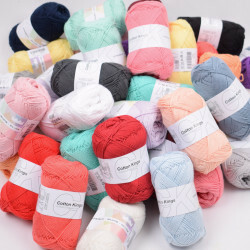 We are true cotton lovers ourselves, and our mission is to find the world’s best, most fun and most colorful cotton yarn at a price where everyone can participate. All qualities are designed and developed in Scandinavia and are produced at professional factories in Turkey and India. 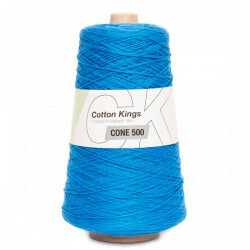 Cotton is one of our most popular yarns. One of the reasons is that it can be used for almost everything – from clothing for babies, children and adults, to dishcloths, towels, pot holders, baskets, teddy bears, blankets and cushions. Only your imagination limits you. 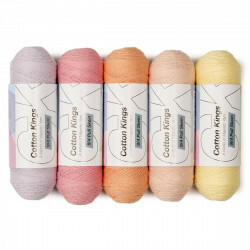 At the same time cotton yarn is also a quality which is easy to mix with other qualities, and thus it is often seen combined with wool, linen or acrylic. 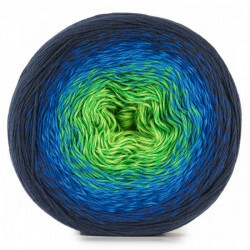 These blends add further qualities to the yarn, e.g. acrylic is very durable. 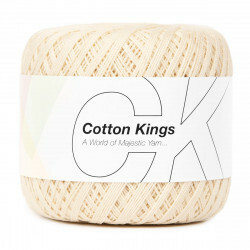 The cotton yarn from Cotton Kings is available in many different versions. For example, you can get it in the classic 4-ply or 8-ply which is a bit thicker. Furthermore, the classic version is available in two printed versions: Cotton 8/4 Print and Cotton 8/4 Soft Print. 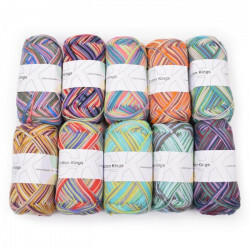 These versions are all multi-colored with beautiful color transitions which add a whole new dimension to your yarn projects. 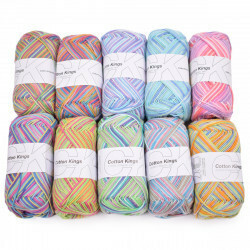 In our product line from Cotton Kings, you will also find some of the incredibly popular cake-yarns which are characterized by being large and round skeins in which the color transitions change from the inside to the outside. 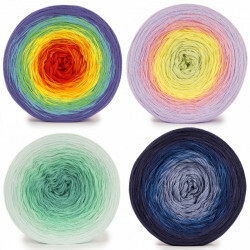 Choose between Twirls, Twirls Deluxe and Color Bomb, all of which have an incredibly beautiful color play in which the hue of the color changes from light to dark – or vice versa – depending on whether you start on the inside or the outside of the skein. 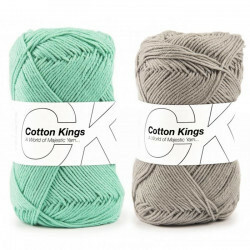 Do you lack inspiration on how to use your cotton yarn from Cotton Kings? 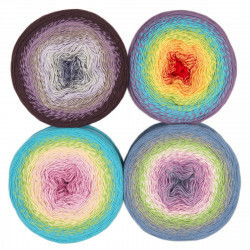 At Hobbii, you will find an abundance of free knitting and crochet patterns for cotton yarn. Among other things, you can find patterns for babies, and cushions, blankets, pot holders, baskets, clothing as well as Easter and Christmas decorations. Follow us and check our site on which we release new patterns from Hobbii’s own designers on a regular basis. We hope you want to participate in our unique cotton universe! Here at Hobbii, we strive to be some of the best and the fastest at delivering Cotton Kings yarn and yarn supplies. Thus, you always receive your goods no later than 3 weekdays after you placed your order online. We take great pride in having a high standard customer service and you can always call us, if you have any questions regarding some of our products. We always provide you with a full refund on goods ordered via our online shop. 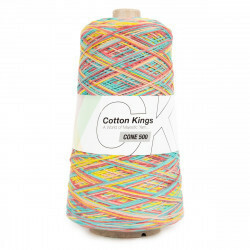 You are always welcome to contact us, if you have any questions regarding our Cotton Kings yarn, or if you need help with ordering. You can contact us via our contact form, and we will answer you as quickly as possible. We are looking forward to welcoming you as a customer. 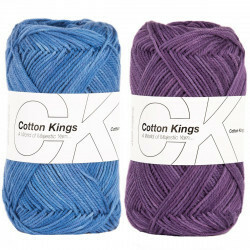 I recently purchased 6 cakes of Cotton Kings Twirls in various colors and I am thrilled with them. I have already completed one baby blanket and started another. I have never used a four-strand fine cotton before and I was pleasantly surprised at how easy it is to work with; it glides well and the resulting fabric is so soft, not to mention the subtle color changes. My shopping cart is filling up again! 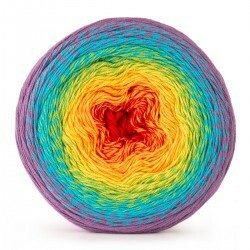 I've bought 2 of the twirls cotton kings..Finished a virus shawl in rainbow colours and think it looks fabulous. I've started another in more muted colours and can't wait to see how it turns out. The threads are fine and lay side by side instead of being twisted so you have to make sure you catch all the threads as you do each stitch but after you get used to how to hold your hook, it gets easier. Have just started using these lovelies - I am making animal photo frames - I have to say that I am very happy with the cotton, it is soft but not too soft for what I am using them for and very easy on the hands which is a big plus for me. I would also recommend these for summer garments as well. I would highly recommend to anyone that they should use these for whatever purpose they choose.